So you came back for the second day - YAY! Didn't you just love the wonderful projects from all the blogs yesterday? I'm sure there will be awesomeness today, too! I've got angels, santa, snowflakes and Rudolph - are you smiling already? My first project today is an angels ornament. I always do something with angels every Christmas. I love pretty angels - I also like cute ones,too - as you'll see below! 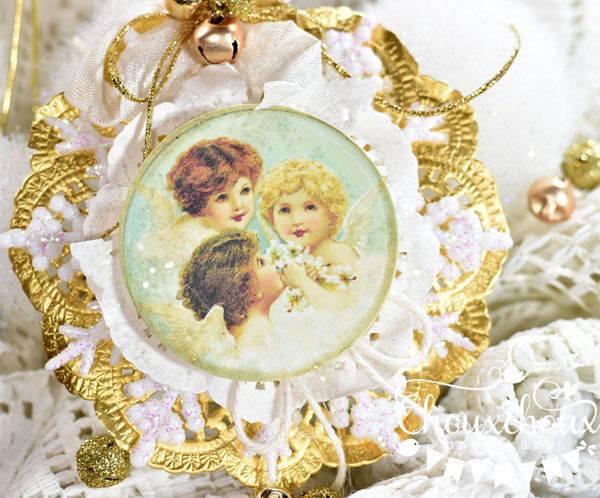 This lovely angel ornament started with a beautiful gold doily. I really love the gold and white. I've got a couple of angel images for you to download below and a video on making these as well. Let's stick with gold and white for a little while longer. My next project is all about this gorgeous image from Moonlighting & Co. - one of our sponsors. Go visit Mary and take a look at her beautiful things - I bet you can't resist something! I created a bag out of an envelope (just seal it up and cut off one end). Then slipped it in an embossing folder - off to one side - and ran it through my Big Shot. It's really pretty (but you have to look really closely at the photo to see it)! Next up, take a look at that wonderful snowflake lattice. Don't you love it? It is a cut file from The Cutting Cafe. Regina is the lovely owner and always generously sponsors Visions of Sugarplums. Go by The Cutting Cafe and you're sure to find just the right cut file (or maybe you might like her new stamps!). I've got the sentiment for you to download below - in three colors! Rudolph, the red-nosed reindeer had a very shiny nose... My cherry sours don't really glow, but they do taste really good and seem like perfectly good Rudolph noses to me! I'm really proud of this printable. It's based on an old 3M tape package that came home with me a couple of years ago from work. We were doing some major cleaning out and I drug home an awesome old typewriter. And hidden inside was the old 3M package. And then to make this tag really awesome - I found My Clip Art Store. Which is where I found that adorable reindeer and the star. You can download Spare Rudolph Noses below. So easy and cute - just print out, cut, hole punch and tie! Just one more project and we can go look at everybody else's! See I told you - that is one cute angel! LOVE the reindeer weathervane and the tiny hiney! She's just waiting for you to download her. Get her below. 1. Download the angels HERE. 2. Download the Snowflakes are Winter's Butterflies Sentiment HERE. 3. Download the Rudolph Noses HERE. 4. Download the Weathervane Angel HERE. Have you linked up at the Challenge yet? Link up your Christmas and Winter projects HERE! If you didn't already, you can click HERE for "Win Your Christmas" from Canvas Pop. How do you win the prizes? Easy! Comment, comment, comment! Comment here on my blog and then comment on all the other blogger's posts, too. For every comment you make during Visions of Sugarplums, I'll add your name for a chance to win one of our prizes. All winners will be randomly chosen and announced on Sunday, December 13th. Now, let's go visit all the other blogs. It's just so much fun! One more day of Visions of Sugarplums dancing in our heads - see you tomorrow! Where do I began???? Everything is scrupmptious! I am loving gold this year too.....beautiful projects! Thank you very much! The projects are awesome. Oh my...so many wonderful things! I love those sweet reindeer noes' I am going to make these for my preschool class! Thank you for the incredible inspiration. So far so wonderful! Lori you have outdone yourself - both with your beautiful makes and with the fantastic team you put together. Everyone seems to have such great ideas. I have had loads of pleasure and look forward to having my morning tea with you tomorrow morning!!! By the way - although the angels are beautiful as well as that Santa image - I love the reindeer noses best of all!! How can I not do that for my grand kids!!!!! Thanks Sugar! I'm loving your projects and would be thrilled to win a prize. Thanks! Wow, all your gold and white, they are all beautiful and so elegant. And so many other beautiful projects. 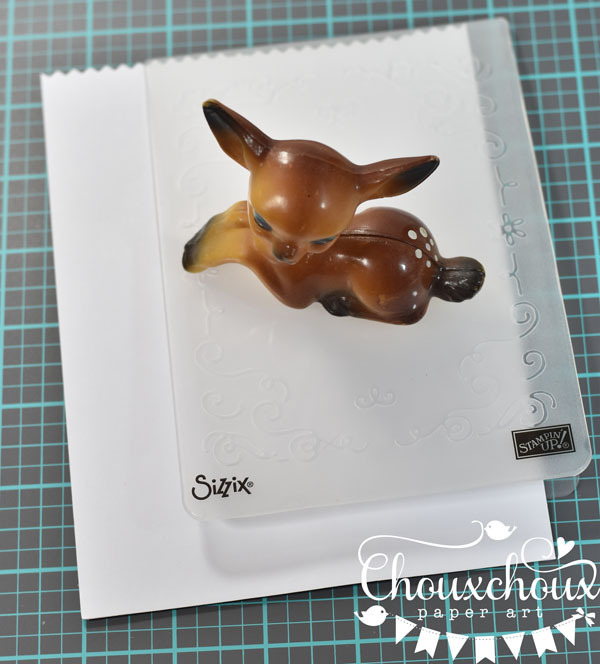 Love going through this blog because there are so many different creations you don't even think about making and what a selection to choose from for a different project other than cards. Great blog. Love your creations, Lori!!! Thank you so much for the links, too. I am definitely going to be shopping at both websites. Merry Christmas!!! I absolutely love all the gold!! Love the sparkle!! Thank you for the video. I am going to make some of these today. I'm back from Day 2 of the Blog Hop...this has brought up a lot of different things I want to do...some for this year; and some I will have to save for next year. This year I've added to my cookie recipes with Chan Cundy's cookies and the gift box and tag for my cookies by Silje Aunan with a theme Melted Snowman. And next year decorating a Christmas tree with all homemade ornaments inspired by your blog hop for the 12 days of Christmas. 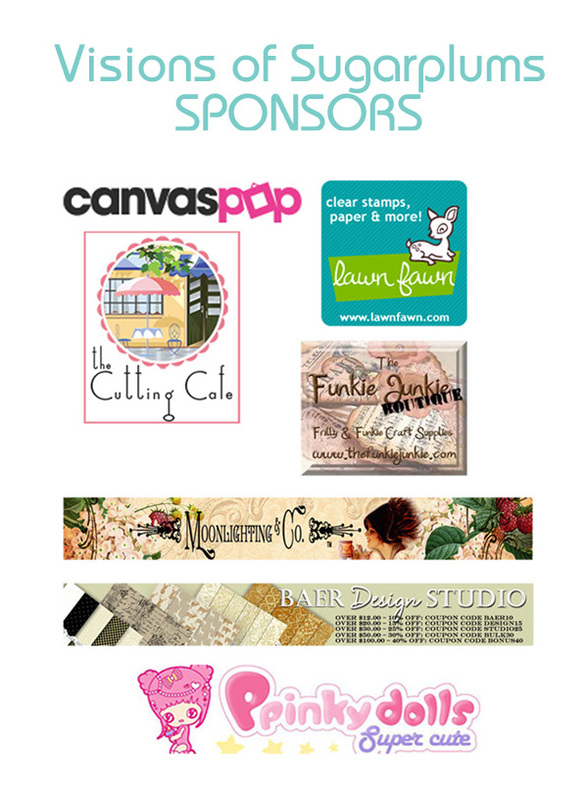 Great blog hop and thanks for all the wonderful ideas from all your members. Congratulations on another prefect year of Visions of Sugarplums! Your projects are wonderful - I love the range of designs - from retro and elegant, to modern and clean! You're amazing! Wow, all of your projects are amazing!! 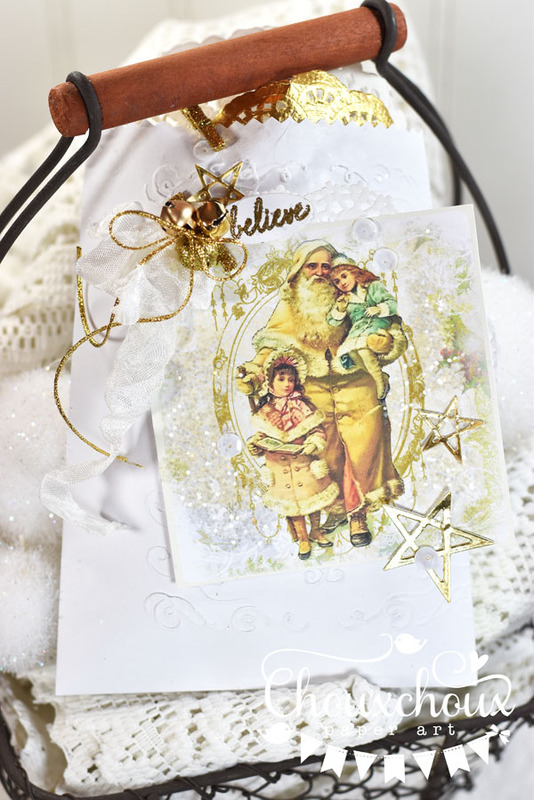 I love the vintage images and all of the fabulous sparkle!! Wow!! 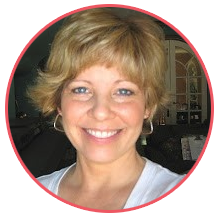 Lori, your expressions of creativity have me WOWed! So much beauty in these elegant, lovely projects...and not just once, but several times over! I'm awed by the versatility of your style; from clean and simple to layered and luscious, you've mastered all! Your projects - and this hop - have my festive spirit glowing! every single project is absolutely gorgeous!! clean and simple to beautifully layered... you can do it all! Oh my stars and halos Lori - sooooooooooo sooooooooooooooo many INCREDIBLY FABULOUS creations. How would you choose a favorite??? I can't! But I did enjoy the video tutorial! Thanks bunches for sharing so many wonderful projects. j.
I love all of these amazing projects! They have a wonderful vintage feel to them and they are all so beautifully crafted too! Love your projects! 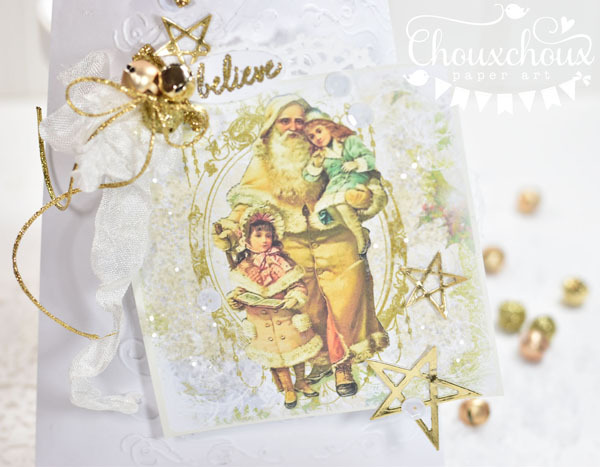 I especially love the gorgeous vintage one with the gold stars! Love all the goodies you created for today's post! I love your vintage images, they remind me of my g'ma, esp that deer! Wow! Each and every project is simply stellar! And the links to freebies, Woot woot. Amazing talent. So glad I'm along for this hop! Thank you. Ah ha! I thought so. I thought I had seen a YouTube video here and couldn't resist coming back to check it out. Wonderful! You really have such a nice blog Lori. 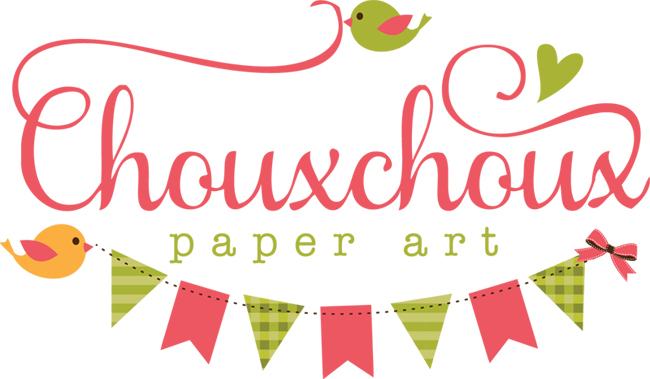 Not just during the Visions of Sugarplums blog hop, but ALWAYS!! You share images, you give us tutorials, inspire us with your wonderful ideas... now you are doing these great YouTube videos. I love these projects. They are ALL SO CUTE!! I have some of those plastic snowflakes. Got mine at the Dollar Store last year. Now I have another project I can use them for. Thanks for the GREAT blog hop!! Hahahahaha...you "ended" that post with a great giggle, 'tiny hiney'...that's precious. I didn't want this post to end. I was having such a great time reading all your steps and inside info. I love your blog and your creativity. Beautiful projects, Lori. Thanks for all the downloads! OMGoodness, Lori, your projects are so adorable! I enjoyed your video and I think I have most of the required items so I would like to try this! As for the other projects, it's cuteness overload! Thanks for all the downloads! 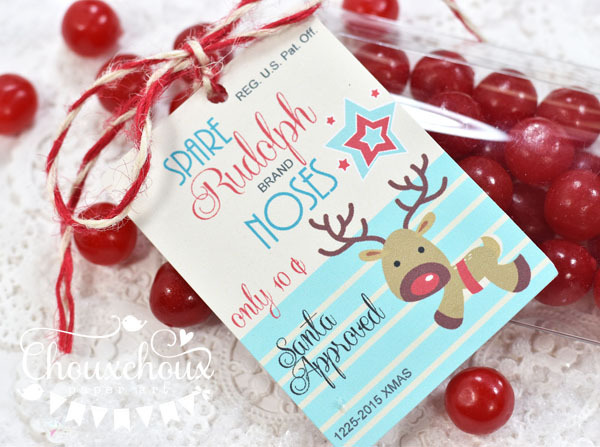 I love the idea of the Rudolph noses - I might make these for my nieces if I can find those candies! Thanks so much for the inspiration - I'm off to check out the hop now! I'm a day behind so I'll have to do 2 days of the hop today! I love all your projects!!! Gold and white is one of my favorite combo!!! Thanks for your inspiration and the downloads! !! Love your snowflake ornament tutorial. So sweet! Hey Lori....I have finally found some time to view your pretty creations, thank you for sharing the video, it was fun to watch!Can't wait to down load the sweet images! Hi, Lori, just popping in to tell you I'm making your Rudolph Noses today! Thanks for the printable - it's perfect - quick and easy! Your event was awesome and I really enjoyed the inspiration! Wishing you the happiest of holidays!